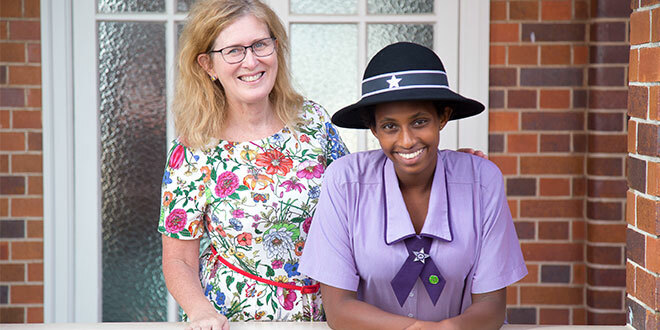 RELIGIOUS sisters caring for abandoned children in Ethiopia received a special gift from a young woman who lived in the nuns’ orphanage for the first nine months of her life. Mehret Lumb was born in Ethiopia and spent the first nine months of her life at Kidane Mehret, an orphanage run by the Franciscan Sisters of the Heart of Jesus, a Maltese order. She was taken in to the orphanage when she was three weeks old, having been born in a homeless women’s shelter. 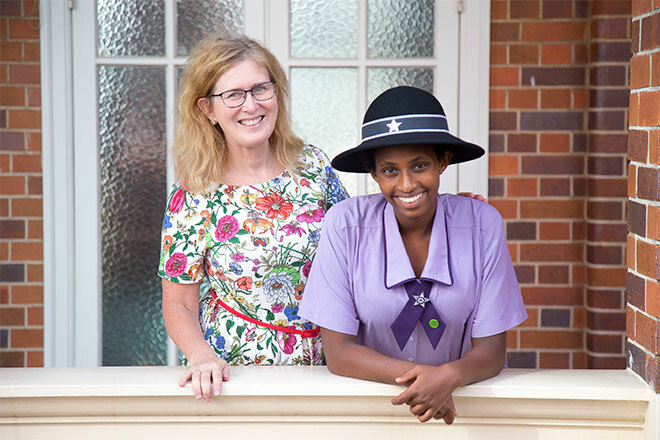 At the same time, Australian woman Joanne Lumb had applied to the Australian Government’s Ethiopia-Australia Intercountry Adoption Program to adopt a child from Ethiopia. Just before the official adoption, Mehret nearly died of pneumonia but recovered, with help from the sisters, before Ms Lumb arrived to pick up her adopted baby. To say thank you, Mehret organised a fundraiser at her school, Lourdes Hill College, Hawthorne, last year and planned on giving the funds to the sisters in person. She and her adoptive mother travelled to the orphanage in December and gave the sisters $1000. Two of the sisters who work at the orphanage, Sr Camilla and Sr Lutgarda, had nursed Mehret when she was a baby and embraced her as she stepped inside the home. 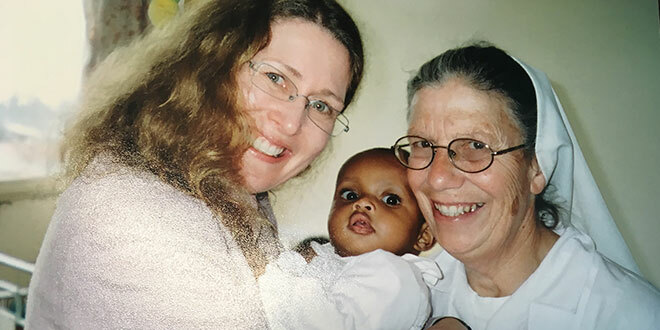 Before: Australian woman Joanne Lumb meeting her adopted baby, Mehret, at the Kidane Mehret orphanage in Ethiopia with Sr Camilla, one of the nuns who cared for Mehret as a baby. 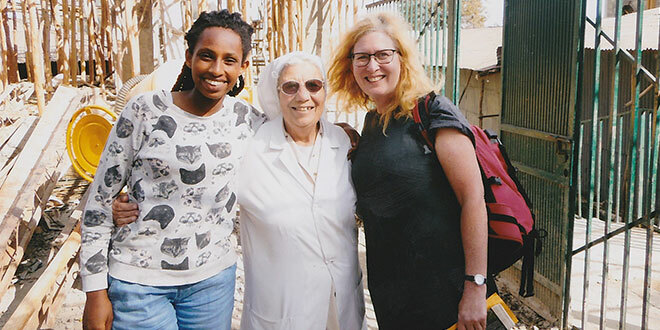 After: Mehret and Joanne returned to Ethiopia in December and were reunited with Sr Camilla. Photos: Joanne Lumb. The money will help the sisters buy baby formula, nappies and medicine, and provide wages for their carers. A number of donations came from The Catholic Leader readers after her story was published in May last year. Mehret also handed over a large box of stationery donated by Lourdes Hill College. “It was really quite emotional,” Mehret said of her visit. “I haven’t seen them in seven years. Mehret said the sisters deserved the money as the orphanage was run down and they needed more funds to care for the children, including a group with disabilities. “Money there in Ethiopia is very scarce and it’s one of the poorest countries in the world, and yet they were so deeply gratified,” she said. During her visit to the orphanage, Mehret also reunited with a woman who cared for her when she lived in the orphanage. The carer remembered Mehret as the only girl in a group of nine babies who were the first adoptees going to Australia. 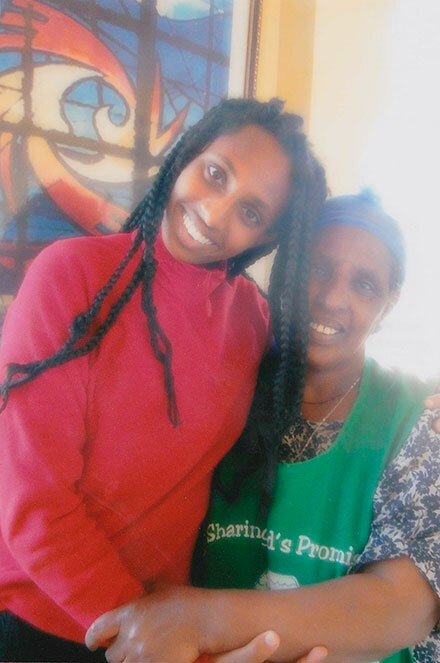 Special reunion: A carer at Kidane Mehret who nursed Mehret Lumb is reunited with her the teenager 14 years later. Photo: Joanne Lumb. The orphanage has a photo of the nine babies who left for Australia, and Mehret has the same one on her bedroom wall in Brisbane. Mehret said she visited the orphanage twice during her trip to Ethiopia and had a chance to play with the babies under the sisters’ care. “It was really emotional because they don’t adopt out to Australia anymore,” Mehret said. 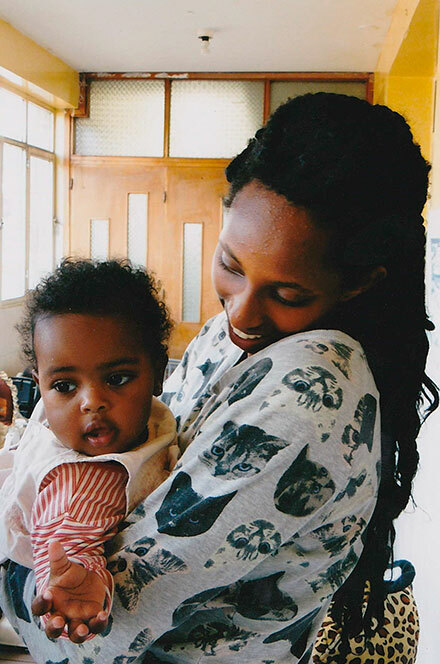 Giving back: Mehret playing with an orphaned baby at Kidane Mehret. Mehret hopes to return when she graduates. Photo: Joanne Lumb. The Franciscan Sisters of the Heart of Jesus look after about 70 children, both in the orphanage and the school. Ms Lumb said at least two children at Kidane Mehret were supposed to be going to adoptive parents, but a moratorium banning all adoptions of Ethiopian children have left their futures uncertain. “Sr Camilla was holding a baby and saying it was supposed to go to America but now we don’t know what’s going to happen to him,” Ms Lumb said. “There’s another little boy there who was very cheeky, a little toddler, very cheeky, and Sr Camilla said, ‘He’s not going to go’. “You know that means they’re going to grow up in the orphanage. The pair also visited a 14-year-old girl that they sponsor, Salem, through a project that cares for destitute children. Salem lives in Addis Ababa with her sister but was originally from Lalibela, a town filled with ancient churches. Mehret, who is in Year 9, is planning on returning to Ethiopia when she graduates to volunteer in the orphanage and help other children who, like her, were left orphaned. 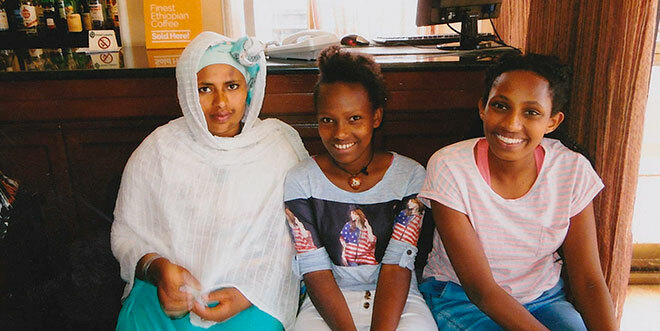 Kindred spirits: Mehret with Salem, a teenager she and her mother sponsor in Ethiopia, with Salem’s sister. Photo: Joanne Lumb.